Small Blessings: Amulet or Accessory? The fashion industry is constantly shifting and looking for something new and different. It looks to past trends, cultures and even the natural world for inspiration, to the extent that many of the clothes that we see in our high street stores echo trends from past decades…although I’m fairly sure there are a few items of clothing we thought, or rather hoped, would never make a comeback! Jewellery is no exception to this and I was amazed to see how much of the jewellery currently being sold in shops mirrors the objects being catalogued as part of the Small Blessing project. In turn, this got me thinking, how much of the original meaning behind the creation of these amulets still remains? The image of the human skull, for example, has been used for centuries in works of art, religious representations and, in more recent times, the fashion world. Known in Latin as memento mori ("remember your mortality" or “remember you must die"), such imagery represented death and served to remind people about the transience of life. 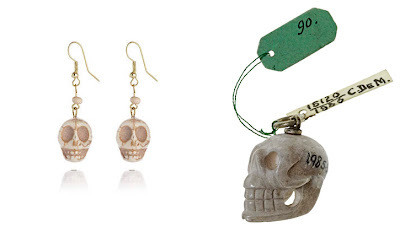 It could be argued that the use of skulls in the fashion world has lost this historic symbolism and has become representative of danger and rebellion instead. 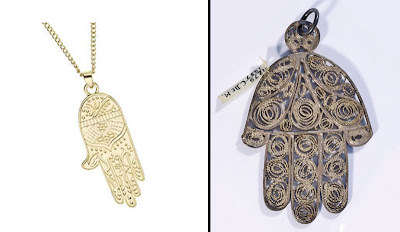 Other objects, such as the ancient Italian corno (horn) amulet and the hamsa (hand of Fatima), are just two of many items that were worn to protect against the Evil Eye, which in many cultures was thought to cause injury or bad luck. Once again there seems to be an abundance of these on the high street – but do people still believe in protecting themselves against the Evil Eye or are they simply interesting shapes well-used in adornment? It is fascinating that certain amuletic symbols have not lost their curiousness or appeal over centuries of use, no matter how far their modern versions may have evolved from their original meaning. So the question is, when does an object stop being an amulet and start being a fashion accessory?